It’s Tuesday – that means Novomatic have released a new slot. This time it’s the turn of Feather Frenzy which takes you to the heart of the rainforest where you join cute and high value birds for big wins. Feather Frenzy may look like a cutesy themed offering but it has the potential to pay out big – with 5 reels and 20 paylines, you can spin away from as little as 20p a spin on all devices including iOS and Android. Set in the rainforest, it benefits from colourful graphics and an upbeat soundtrack (head for the mute button if you’re in a busy surrounding). With succulent fruits and cute birds on the reels, keep an eye out for the blue bird – 5 across a payline will reward you 100 times your stake. If you fill the reels with this bird, you’ll pocket a whopping 2,000 times your total stake. Feather Frenzy comes with a Free Games feature where up to 25 free spins can be won – there’s a key symbol which can appear on the 3 middle reels. With caged bird symbols appearing, a key landing on the same free spin will give you the cash prize shown – this can be anything up to 100 times your stake. If you were to get 2 or 3 key symbols alongside caged bird symbols, you will win 2 or 3 times (respectively) the cash prize. This can lead to pretty decent wins if you get high value caged birds. This is in addition to the normal payouts. At best, you can expect 300 times your stake on each free spin from the caged birds! Medium variance, this slot has decent potential due to the high value symbols and the cash prizes from the caged birds. For more details, and to try for free, check out the Feather Frenzy slot review. 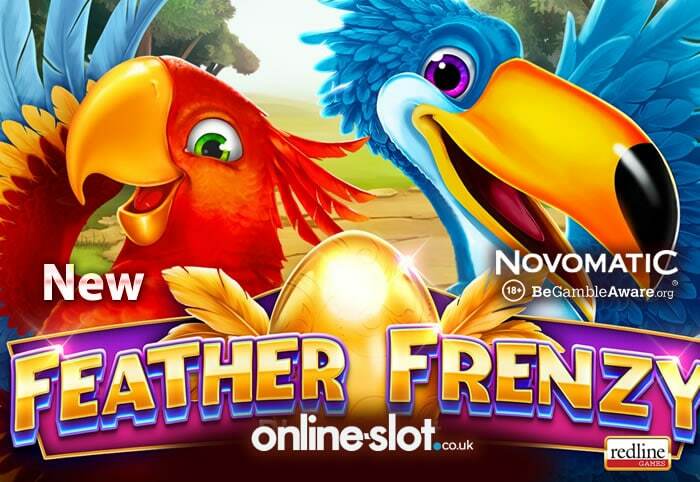 You can play Feather Frenzy at Casumo Casino – sign up to get 20 no deposit free spins on NetEnt’s Starburst and a 100% first deposit bonus up to £300. The other option is SlotsMillion Casino – sign up and deposit to get a 100% match bonus up to £100 plus 100 extra spins. You’ll get 20 extra spins per day for 5 days across 5 different NetEnt titles.